When one thinks of the one song that defined the farfisa and organ sound in garage rock, "96 Tears" burns itself right into your neurons. "96 Tears" is the calling card of the ever illustrious Question Mark and the Mysterians. Question Mark and the Mysterians were formed by a group of Mexican teenagers who were born in Texas and raised in Saginaw, Michigan. The original group was composed of was lead singer Rudy Martinez, his brother Robert on drums, Frank Rodriguez on keyboards, Bobby Balderrama on guitar and Larry Borjas on bass. Having their minds melted by the Japanese science-fiction film "The Mysterians," the boys decided to call themselves Question Mark and the Mysterians. Larry Borjas and Robert Martinez were drafted into the military. They were then replaced by bassist Frank Lugo and Eddie Serrato. Now known as Question Mark, Rudy Martinez came up with the lyrics to a song called "Too Many Tears." The band then decided to rename the song "69 Tears." A killer title but which was too dangerous the old moral majority, renamed "96 Tears," the song was a monster on the Mt. Holly ski lodge circuit. 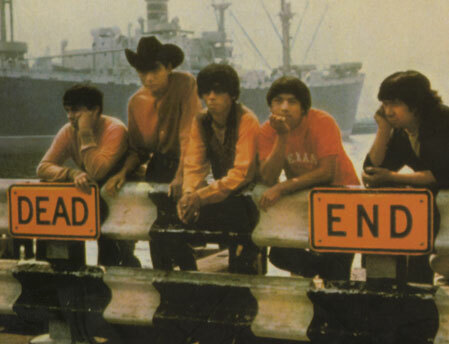 Realizing the explosive potential of "96 Tears," the band's manager Lilly Gonzales rushed the boys into Shields recording studio in Bay City Michigan to cut it, with the future Chicano-rock legend Rudy Tee Gonzales in the producer's seat. Pressing up 750 records, Lilly released the song on her Pa Go Go label. "96 Tears" started to terrorize the Detroit and Flint. Finding themselves in a bidding war, the band settled on Cameo Parkway because their label was orange, Question Mark's color. Re-released on the Cameo Parkway label, the record shot to #1. Question Mark then decided to legally change his name from Rudy Martinez to ?. ? was to become the most colorful front man this side of Sun Ra. Never without his trusty pair of sunglasses in public, ? would claim to have been born on Mars and lived among the dinosaurs in a past life. Recording two records two long players for Cameo which didn't burn their way up the charts, the group went on to record for Capitol Super K and Ray Charles Tangerine and TRC labels. The group then broke up. Question Mark then went on to work as a dog breeder. Cutting some demos with the man on every scene in 1978, the band reformed for a reunion concert in Dallas in 1984. Question Mark then started getting voices from the future in his head to reform the band. The band reformed in 1997. Reunited with Bobby Balderrama, Frank Rodriguez, Frank Lugo and his brother Robert, ? and company hit the road scorching everything in their path. With a ferocious live show, Q and the Mysterians are trying to heed the voices which told Question Mark he would be performing "96 Tears" til 10,000 and all this despite despite Allen Klein's refusal to reissue the band's Cameo Parkway material.